Daryl W. Guberman, the operator of the self-accredited certificate mill G-PMC, was arrested in May of 2015 for driving under the influence, by the Montville Police Department in Uncasville, CT. 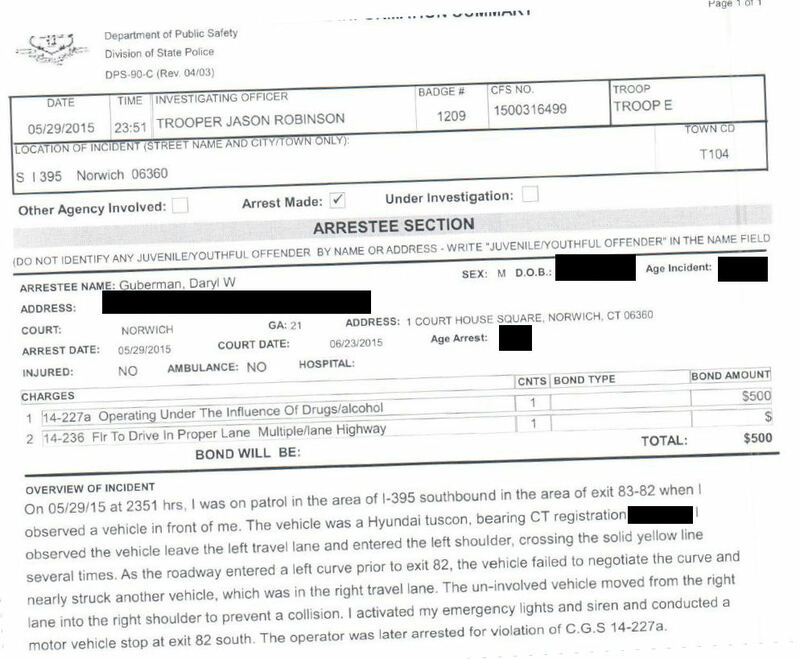 According to the official arrest record, Guberman’s driving was so erratic, he forced another vehicle into the shoulder to avoid a crash, when Guberman failed to navigate a turn. Guberman is currently under “review” by the Connecticut State Attorney General’s office for possible fraud involving his granting of self-accredited restaurant food safety inspection certificates in New York, Massachusetts, New Jersey and Connecticut. Guberman has claimed his “food safety inspectors” are certified by the New York City Dept. of Mental Health and Hygiene, which has reported they have never heard of Guberman nor any of his alleged inspectors. The review stage typically precedes a formal, criminal investigation. In the past, Guberman’s company agreed to provide an ISO 9001 certificate to a fictional company that claimed to manufacturer life vests made of concrete, designed to kill the wearer. He recently posted an antisemitic rant against the Orthodox Union, invoking the highly controversial opinion that Jews murdered Jesus Christ, in an attempt to promote his own self-accredited Kosher food certification program. One recipient of Guberman’s self-authored “ARM 9009” certification revealed that they received the certificate without ever having obtained a copy of the alleged ARM 9009 standard. Guberman and LaBelle have engaged in increasingly bizarre behavior, filing dozens of Digital Millennium Copyright Act (DMCA) takedown notices against Oxebridge, alleging copyright over material which they do not own, including photos of US TAG members Alka Jarvis, Paul Palmes, Denise Robitaille, Lisa Uhrig and Julie Congress. This creates new legal difficulties for Guberman and LaBelle in that the filing of frivolous DMCA claims is punishable per 17 U.S. Code § 512 (f), and that falsely impersonating one’s self as the legal representative of another is a criminal offense under laws governing false impersonation. In one of the DMCA filings Guberman claimed a report by Oxebridge questioning his claims that “Bill and Hillary Clinton are friends of Daryl Guberman’s family” amounted to defamation because, he insisted, they really were friends of his family. To prove it, he provided a photo of the back of someone’s head, on which he placed an arrow to indicate it was Bill Clinton. Only two months later, Guberman was found reposting hateful news articles about both Bill and Hillary Clinton on Facebook, which call the Clintons criminals and demand that Hillary Clinton be put in jail. Guberman’s MySpace page includes a disturbing video of a pit on a spit, apparently being roasted in a sheet metal factory, while Guberman provides a Donald Duck voice over. Guberman used the same Donald Duck voice when he left an obscene voicemail on the Oxebridge phone system, which you can hear here. Guberman broke onto the ISO 9001 scene in 2012, when he published — with the help of LaBelle’s paid press release service company IndustrialPR — a self-authored story that claimed “In the World of ISO, He’s It” and then another self-authored piece in 2013 claiming Guberman had won “in a landslide” the award of “Best ISO & Quality Consultants in the Country”; in reality, no such award exists. Recently, it was discovered that Guberman’s G-PMC was boasting ISO 9001 certification from another certificate mill out of India, Generic Management Services. The certificate appearing on the G-PMC website includes the logo of the Romanian certification body RENAR, and representatives of that registrar have confirmed that the usage of the logo is fraudulent. That case is being investigated by the National Accreditation Board for Certification Bodies (NABCB) and RENAR. Guberman has refused to take down the certificate despite being notified of its fraudulent status. On Facebook, Daryl Guberman recently announced his intention to run for the US Senate, referring to himself as a “business tycoon.” His campaign appears to be comprised nearly entirely of defamatory posts against Oxebridge and ANAB.